This is a Buddhist themed design I created based on a statue of the bodhisattva Kwan Yin. Kwan Yin (also written as Guan Yin, Kuan Yin etc.) is the bodhisattva of compassion as venerated by East Asian Buddhists. Kwan Yin is commonly refered to as the Goddess of Mercy. I suggest using this pale grey colored text as shown. 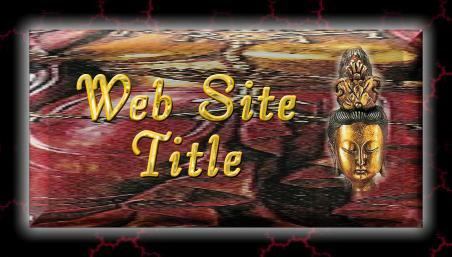 Above you see a title graphic with Kwan Yin for you to insert a web page title on. If you don't have a graphic program capable of doing that, e-mail me and I will do it for you as time allows. Below you will find a lotus graphic divider and bullet designed for this page. The Buddhist lotus text buttons are designed for this page and are linked for this site so that you can navigate through it. Due to her symbolising compassion, in East Asia Kwan Yin is associated with vegetarianism. Chinese vegetarian restaurants are often decorated with her image, and she appears in many Buddhist vegetarian pamphlets and magazines. The above title graphic and buttons use the font "Bernard Tango BT"
To save, you may download the .zip file which includes the graphics and HTML template. Do not link to the graphics on this page! Please note that this set is free to use on personal websites only. Those sites that hope to generate income (business site) there is a one time requested minimum $10 donation payable through Pay Pal (mail donations to mail@kytheraann.com).